Seminis has been buying up patents on most nursery seed varieties like Early Girl and Better Boy tomatoes for decades. Even if the particular seeds you choose from this company aren’t GMO, you’re still sending money back to Monsanto. The only way to be sure you’re not buying genetically modified seed is to buy organic, heirloom or open pollinated seed from companies who take the Safe Seed Pledge. Sustainability Starts at Home: How to Save Money While Saving the Planet . The Seed Savers Exchange is a non-profit working to save heirloom garden seeds from extinction. Their focus is on preserving varieties gardeners and farmers brought to North America when their families immigrated here, along with traditional varieties grown by Native Americans, Mennonites and the Amish. You can find almost extinct varieties of fruits, veggies and grains in their amazing annual yearbook, and all the money you spend goes to helping protect seed biodiversity. Baker Creek is a family-owned business offering over 1,800 varieties of vegetables, flowers and herbs—one of the largest selections of heirloom varieties in the U.S. They specialize in rare and hard-to-find heirloom seeds from over 75 different countries. The company’s mission is to promote and preserve our agricultural and culinary heritage. They have a smaller selection, but provide warm, highly personal customer service, great prices and fast delivery. Southern Exposure Seed Exchange specializes in vegetables, flower, herb, grain and cover crop seeds that perform well in the Mid-Atlantic and Southeast. They offer many unusual Southern heirlooms, such as yacon, amaranths including peanuts, southern peas, naturally colored cotton, collards, okra, roselle, turnip greens, corns for roasting and meal, and butterbeans. Fedco is a cooperative business where members own up to 60 percent of the company. Because profit isn’t its primary goal, their products are quite affordable. 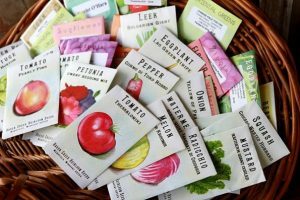 The owner of this small company personally selects and sells only the varieties that are very special for home gardeners, based on great flavor, easy culture and exceptional garden performance. All their seeds are time-tested heirlooms, the best international hybrids or fine open-pollinated varieties tested and guaranteed for every major U.S. climate zone. Peaceful Valley is dedicated to organic food production, carrying a large assortment of veggie seeds, cover crops, native grasses, pasture and lawn seed, wildflowers, fruit trees and berries, potatoes, onions and garlic. They also offer a great selection of gardening tools, pest control, season-extending products, composting supplies, growing, propagating and irrigation equipment, and books. Territorial Seed is a large, family-owned company whose mission is to improve people’s self-sufficiency and independence through gardening. They offer hybrid, open-pollinated and heirloom seed varieties. Seeds of Change was acquired by the Mars company, which has supported GMOs in their food products. Unfortunately, since the demand for organic products is so high, many organic brands have been bought out by large corporations. However, Seeds of Change is the only organic, open-pollinated seed company available at mainstream stores nationwide, like Home Depot, Lowe’s, Walmart and Whole Foods. I’m interested in hearing why the author chose not to include High Mowing Organic Seeds. I also would like to know why High Mowing wasn’t on the list….. I have a small retail nursery on the East Coast and do my best to remain as Earth friendly as possible. Does the author know off hand if these companies offer wholesale pricing? We have a small organic family farm in Oregon and an all organic, open pollinated seed business called Siskiyou Seeds. For a dozen years we produced wholesale organic seed for many of the other companies listed. Few, if any of them actually produce their own seed and most on this list repackage conventionally grown seed produced overseas- while their customers have the impression they are supporting a family farm business. Point is – do your homework and try and support bio regionally adapted seed stewards. My daughter and Son in law own Redwood orgainic seeds. A local organic seed company growing organic seeds in Manton,Calif. in the foot hills of Lassen National park. All seeds grown, harvested by hand and packaged on their forty arce farm. Check them out. Redwood seeds.net or call Kalan Redwood at 530-524-5537. You will be a happy gardener. All of these companies are good as well as Seeds for Generations!! And Park Seed! Yes! I’m a Vermonter who drives by High Mowing weekly…out in the country! Quality, reliable product!